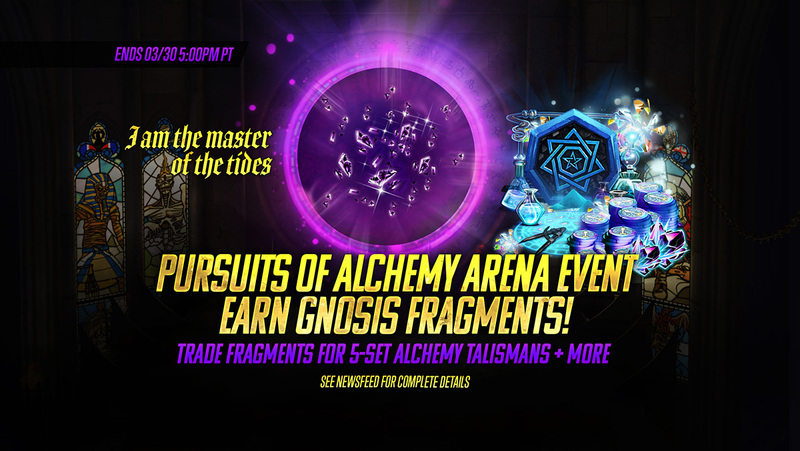 23 Mar Earn new 5-set Alchemy Talismans – Pursuits of Alchemy Arena Event on Now! Earn Gnosis Fragments to trade for valuable rewards! Earn Gnosis Soul Fragments, Iron Coins, and Gold by achieving milestones in the Arena! There is no limit to these rewards! Please note that these items will be granted when you complete your Arena battle, and will stack if you meet multiple requirements. For example, when you reach 50 wins, you will earn the rewards for 10 wins, 25 wins, and 50 wins at the same time; this results in combined rewards of 300 Iron Coins, 300 Gnosis Fragments, and 50,000 Gold. Use Gnosis Soul Fragments in the Event Store to purchase limited time items including, Frontier Coins, Cosmic Evo Materials and ALCHEMY TALISMANS our latest 5-set talismans! Alchemy Talismans are blue Talismans with a 5 set effect. Equip them to grant Invincibility to all allies for the first turn of battle. These talismans also transform Negative Effects on all allies into Beneficial Effects every turn and permanently reduce a random stat on all enemies by 5% every time you attack. See the full list of limited time Event Store items in the in-game newsfeed!